Do you use a tide chart to find the best time for your Saturday walk, too? 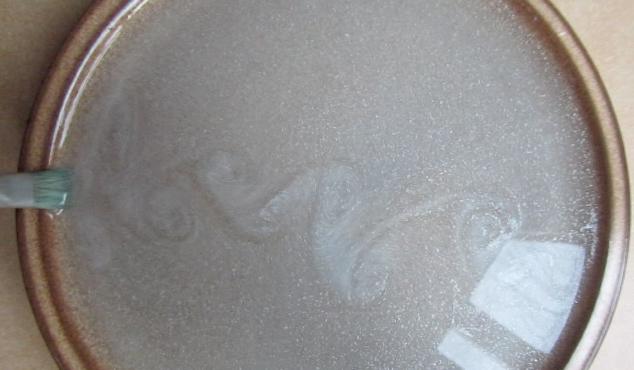 I showed you a vortex street on a plate formed by pulling a paint brush through sugary water as an example. 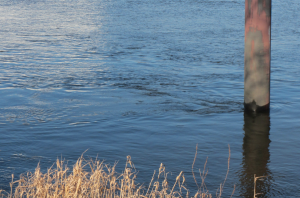 Now today I want to show you the real thing: Instead of stagnant water and a moving object, I bring to you the flowing Elbe river and a bollard! Watch how vortices with alternating spin are shed every three or four seconds! 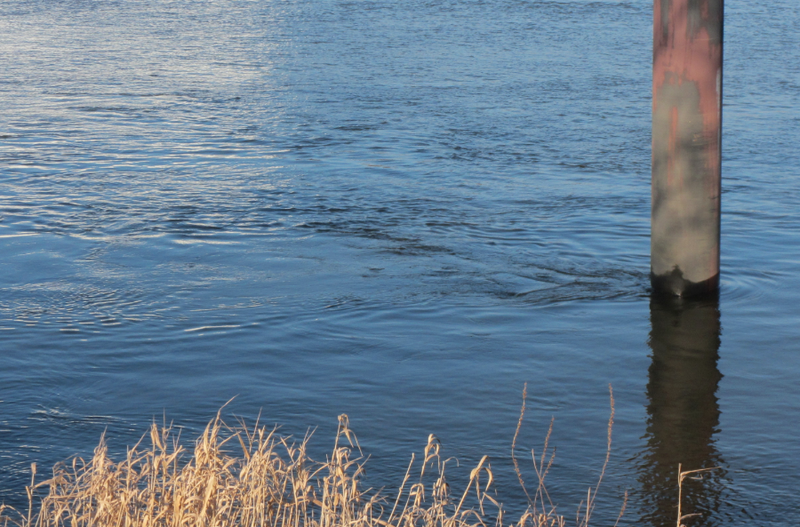 This entry was posted in observation and tagged eddies, Elbe, instability, vortex street on March 6, 2015 by mglessmer. 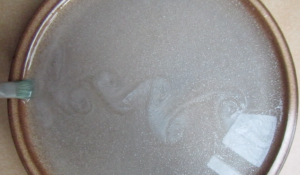 I took a plate, mixed some sugar, silvery water color, and water, pulled some stuff through the water and that was pretty much it. As a first order approximation, pulling an object through a stagnant water body is the same as the water body moving past a stationary object. And since it is usually pretty difficult to visualize flow around stationary objects (at least if you don’t want to pollute that little creek nor waste a lot of water). So this is really exciting. The plate I am filming is the one underneath the camera (I love my gorilla grippy). 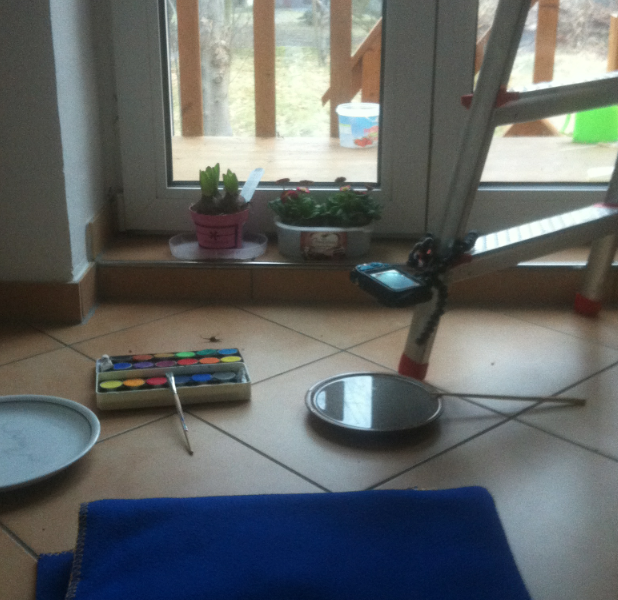 My water colors from back when I was in primary school, a paint brush, a chop stick, the plate I tried first that turned out to not have enough contrast with the silver paint, a blanket because the tiles are cold to sit on. Oh, and the flowers that I have been meaning to put into nice pots for a couple of days now. So – no big mystery here! Go try! And let me know how it went. 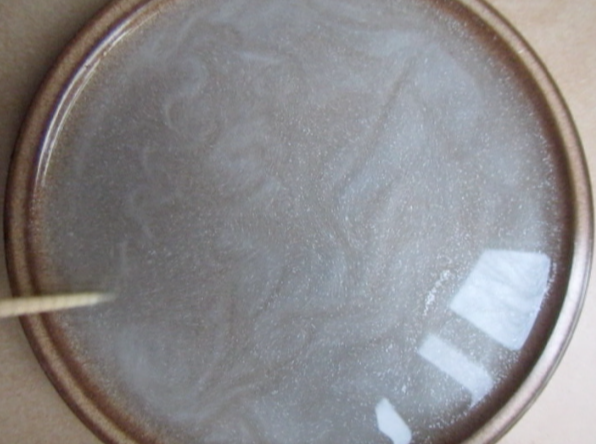 This entry was posted in demonstration (easy), hands-on activity (easy), kitchen oceanography and tagged eddies, kitchen oceanography, turbulence, vortex street on February 23, 2015 by mglessmer.